More than 1,000 people have attended a candle-lit vigil in memory of a gay barman beaten to death in London. David Morley, 37 and from Chiswick, west London, died after he and a friend were attacked on the city's South Bank. People gathered at a packed St Anne's Church, in Soho, on Friday while others held candles in the street. Some then proceeded to the crime scene. One of seven people arrested in connection with last Saturday's attack has been released on police bail. The released suspect and five others were held on Thursday in south London, while a seventh person was arrested on Friday. Scotland Yard said it would continue to question those still being held on Saturday. Police say they are continuing to treat Mr Morley's murder as being motivated by homophobia until it is proven otherwise. 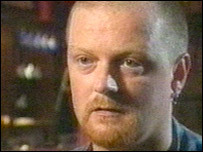 Mr Morley worked at the Admiral Duncan Pub, in Soho, in 1999 when a nail bomb killed three and injured 73. David Morley survived a nail bomb attack on a pub in 1999. At Friday night's vigil, Mr Morley's friend Sally Graham said the bartender would have been happy that so many of his friends had made the ceremony. "This is the second time he was in the wrong place at the wrong time, but for all of us here today he will be in the right place at the right time, which is a very special place in all of our hearts," Ms Graham told the crowd. A tribute from London mayor Ken Livingstone was also read out. "David Morley was well known and well loved in London's lesbian and gay community," Mr Livingstone said. Mr Morley's friend Steven Allen said the gay community had been pleased detectives had acted so quickly. "We're not looking for vigilantism, we're looking for justice here," he said. 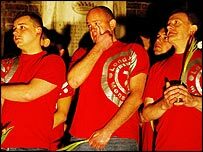 As the London Gay Men's Chorus sang at the service, a memorial book was passed among the crowd. Mr Morley's friends said the night was a celebration of a beautiful and vibrant life. Later, friends held hands as a song written about Mr Morley was sang and a period of silence was observed. 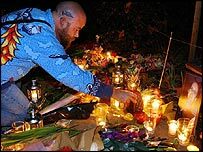 By the end of the service the Admiral Duncan memorial bench was covered with candles and flowers. A group of about 100 people then walked to Hungerford Bridge, where Mr Morley was attacked. Mourners lit more candles and placed flowers near a police board appealing for witnesses. Mr Morley suffered bruises, a ruptured spleen and fractured ribs in the attack which happened at 0300 GMT. A post-mortem examination showed he died from multiple injuries - he had suffered 40 distinct bruises - to his head and body.